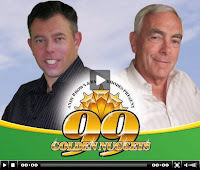 Andy Brown, of GolfSwingSecretsRevealed.com, has commenced his web campaign for our CD, ’99 Golden Nuggets to Demystify the Rules of Golf’. If you visit http://www.golfswingsecretsrevealed.com/99goldennuggetswoods.htm you can see my video explaining the Tiger Woods / mushroom incident, which involves Rule 13-2 - Improving Area of Intended Swing. Then, if you sign-up at this page (there is no obligation in doing so), you will receive more video links and explanations of other Rules incidents involving Steve Lowery, Michelle Wie, Phil Mickelson and Michael Thompson. They’re free and you can unsubscribe whenever you like. It has to be worth it.